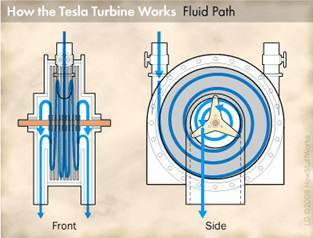 Compared to a piston or steam engine, the Tesla turbine is simplicity itself. In fact, Tesla described it this way in an interview that appeared in the New York Herald Tribune on Oct. 15, 1911: "All one needs is some disks mounted on a shaft, spaced a little distance apart and cased so that the fluid can enter at one point and go out at another." Clearly this is an oversimplification, but not by much. Let's take a look at the two basic parts of the turbine - the rotor and the stator - in greater detail. In a traditional turbine, the rotor is a shaft with blades attached. The Tesla turbine does away with the blades and uses a series of disks instead. The size and number of the disks can vary based on factors related to a particular application. Tesla's patent paperwork doesn't define a specific number, but uses a more general description, saying that the rotor should contain a "plurality" of disks with a "suitable diameter." Tesla himself experimented quite a bit with the size and number of disks. Each disk is made with openings surrounding the shaft. These openings act as exhaust ports through which the fluid exits. To make sure the fluid can pass freely between the disks, metal washers are used as dividers. Again, the thickness of a washer is not rigidly set, although the intervening spaces typically don't exceed 2 to 3 millimeters. A threaded nut holds the disks in position on the shaft, the final piece of the rotor assembly. Because the disks are keyed to the shaft, their rotation is transferred to the shaft. The rotor assembly is housed within a cylindrical stator, or the stationary part of the turbine. To accommodate the rotor, the diameter of the cylinder's interior chamber must be slightly larger than the rotor disks themselves. Each end of the stator contains a bearing for the shaft. The stator also contains one or two inlets, into which nozzles are inserted. Tesla's original design called for two inlets, which allowed the turbine to run either clockwise or counterclockwise. This is the basic design. To make the turbine run, a high-pressure fluid enters the nozzles at the stator inlets. The fluid passes between the rotor disks and causes the rotor to spin. Eventually, the fluid exits through the exhaust ports in the center of the turbine. One of the great things about Tesla turbine is its simplicity. It can be built with readily available materials, and the spacing between disks doesn't have to be precisely controlled. It's so easy to build, in fact, that several mainstream magazines have included complete assembly instructions using household materials. The September 1955 issue of Popular Science featured a step-by-step plan to build a blower using a Tesla turbine design made from cardboard! But exactly how does a series of disks generate the rotary motion we come to expect from a turbine?